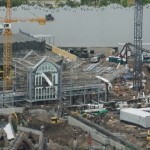 New Photos of Construction at Universal Orlando’s Hogsmeade Attraction May Give Biggest Thematic Clue Yet! “Universal Orlando Resort is working on exciting new experiences for guests to continue to celebrate The Wizarding World next year. 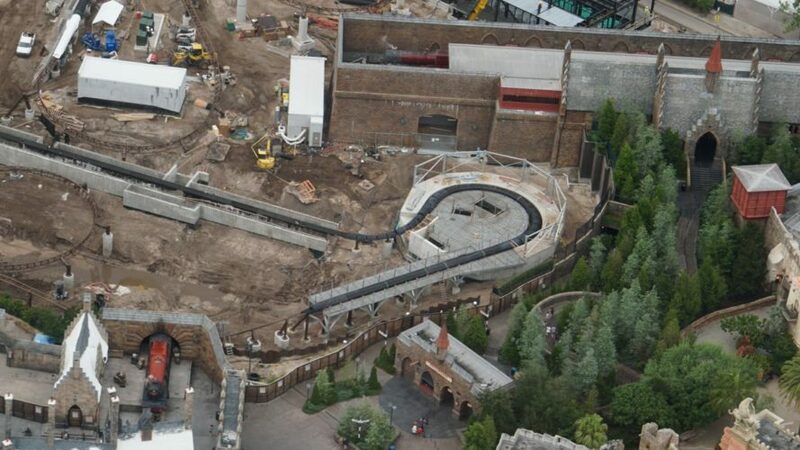 These include the all-new thrill ride coming to The Wizarding World of Harry Potter – Hogsmeade and additional fan experiences that have yet to be announced. 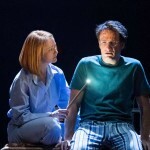 While the statement was hugely disappointing to many devoted Potter fans, the news that the “all-new thrill ride” is on the agenda is definitely a consolation. In fact, Attractions Magazine released new photos of the site Monday which reveal the biggest clues to the ride’s theme that we’ve had yet! The photo shows the structure of a building surrounding a portion of track. The entry and exit points can be seen, including a significant descent at the presumed exit, and it appears that the structure will eventually be enclosed. The most interesting detail is the intricate structural work surrounding that exit point. 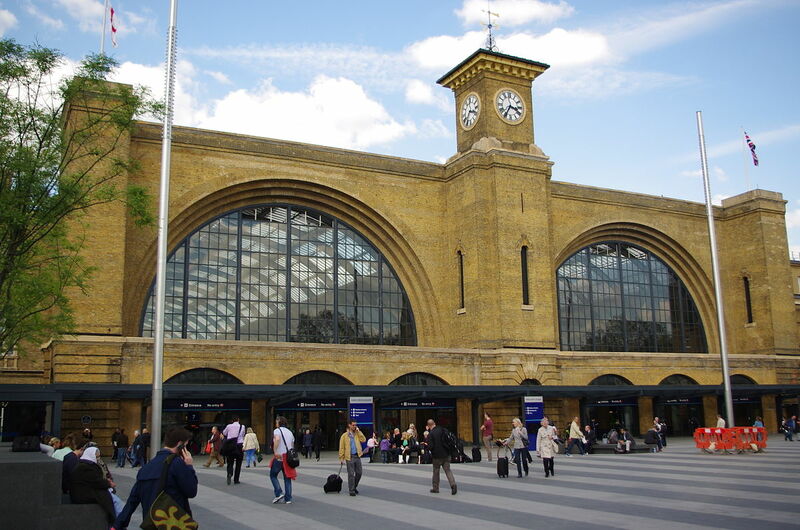 Some online speculation suggested that the façade could be part of King’s Cross station, but as seen in the images below, the architecture of King’s Cross is far more modern than the Hogsmeade attraction’s design. Upon closer examination, however, we think this most closely resembles the large ornate window at the far end of the Great Hall at Hogwarts School of Witchcraft and Wizardry. 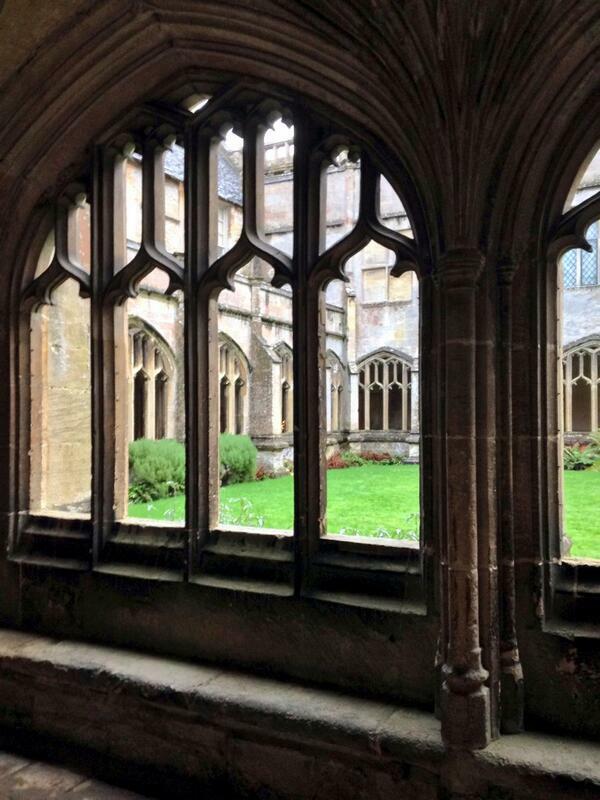 Note how similar the arches look in the picture above as compared to the set of the Great Hall below. Granted, the angles are different, with one shot showing the exterior and the other coming from the interior, and the number of panes don’t match up exactly, but it’s the closest fit from the wizarding world we’ve been able to find. What gives us a small measure of hesitation is the fact that, to date, Universal has been incredibly fastidious about matching up details from the films to locations in the parks. The style of the structure does still closely resemble the architecture used elsewhere to depict the buildings of Hogwarts. The familiar archways below are, for example, very similar. Is it possible that Universal is taking some artistic liberty to stylistically display a part of the Hogwarts school? IF that is the case, what could be their purpose in rebuilding a portion of the castle when another sits almost immediately adjacent and is prominently featured as part of the “Harry Potter and the Forbidden Journey” ride? It doesn’t seem like Universal to be redundant, especially when the cost is so high–unless the reason is pretty spectacular! Leaky previously theorized that the attraction was likely to focus on the Forbidden Forest or Hogwarts grounds. Knowing that there is a spot for animatronics, we speculated that could potentially be Grawp, Aragog or the Whomping Willow. The majority of the ride is also still not enclosed, which suggests an outdoor adventure. However, we’re not sure what penultimate moment within the school would line up with such a theme. 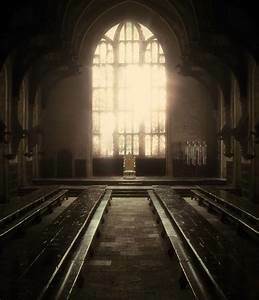 It’s still possible, of course, that Hogwarts could be a launching point for a trip through the forest–after all, Fred and George Weasley exited the Great Hall, albeit from the other end, in spectacular fashion!–but no specific story from the Harry Potter series clearly matches up with what we’re seeing. Yet. In Harry Potter and the Deathly Hallows, Severus Snape does crash through the window of the Great Hall after his duel with Professor McGonagall. This would seem an odd event to include unless it was a Snape-centric ride, which, in itself, seems odd given that he is viewed as an antagonist as often as he is lauded as a hero. If not more so. Although, an animatronic featuring a striking Nagini would be incredibly scary and thrilling! 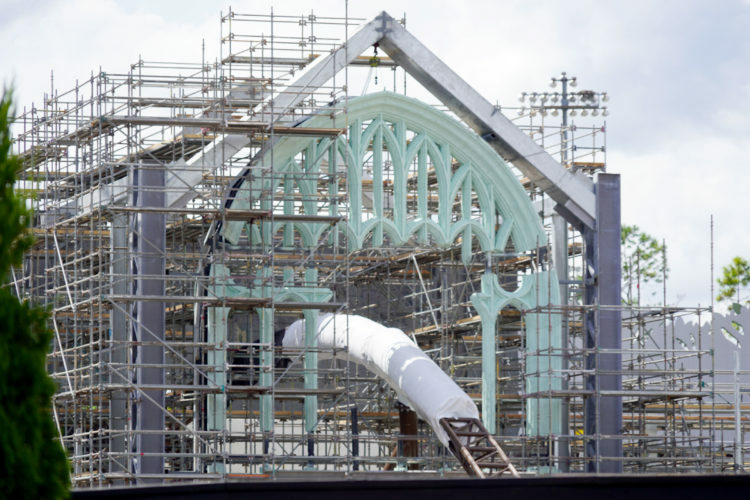 It’s possible Universal is aiming for a Battle of Hogwarts-themed attraction and that exploding through the Great Hall would be part of that large-scale confrontation, if not explicitly depicted in the films. Dueling went on all over the castle, and the castle was, in large part, reduced to rubble in the aftermath, so it could certainly work. A large part of the battle also took place on the grounds, which would fit with the outdoor venue. The animatronic, the base of which is seen above, could easily be one of the giant horde or one of Aragog’s children. The dead-stop feature and the elevator lift, both previously discussed by Leaky, could also fit with this storyline. The dead-stop could occur as riders meet blow-back from Voldemort’s Avada Kedavra curse, the explosion as Seamus and Neville blow up the bridge, or simply engagement in any one of numerous duels. 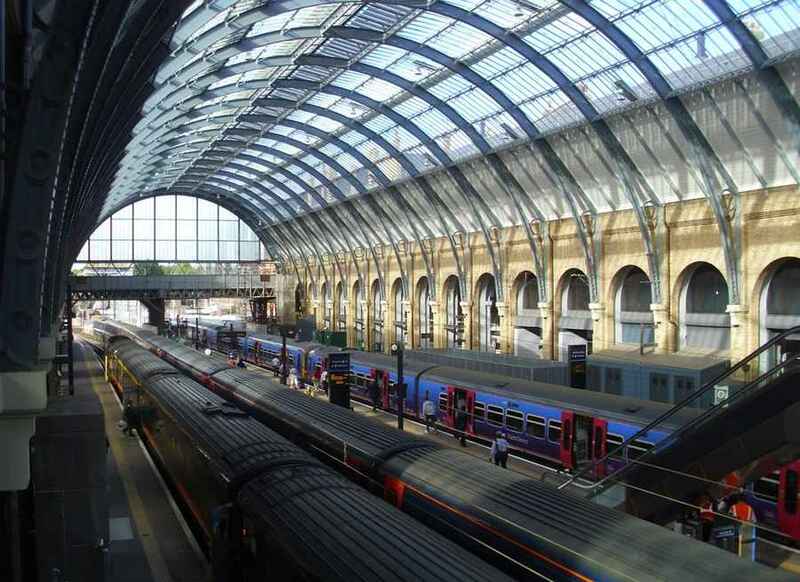 The elevator lift could bring witches and wizards into the fray or deliver Harry into King’s Cross station for his other-worldly heart-to-heart with Dumbledore. Or, to return to the previous concept–albeit far-fetched–of a Snape-themed ride, the elevator lift could descend into Snape’s memories and lift Harry back to reality. Even evaluating all the we do know, the possibilities still seem endless! What do you think of this latest clue, Potter fans? 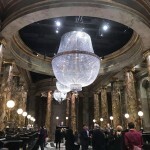 Is the new structure part of Hogwarts’ Great Hall? 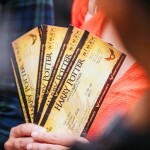 Will the attraction take riders through the Battle of Hogwarts–or something else? Share your theories in the comments! See more photos of construction at Attraction Magazine here. 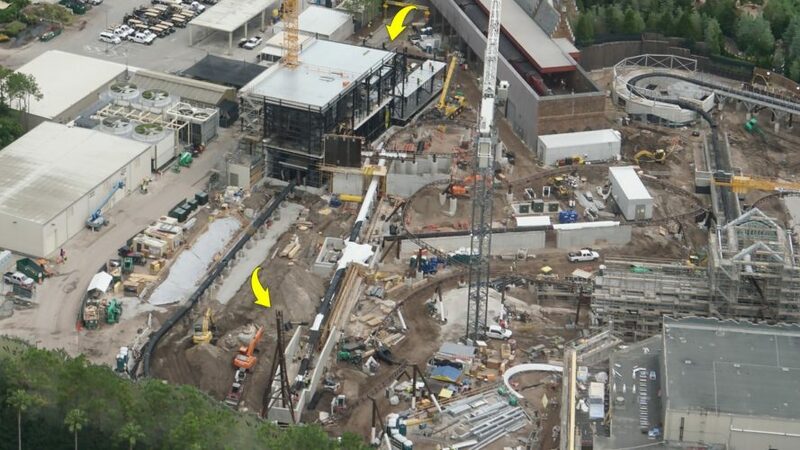 Also read Leaky’s coverage of the rumored fourth park and how it might tie into the Fantastic Beasts film series! 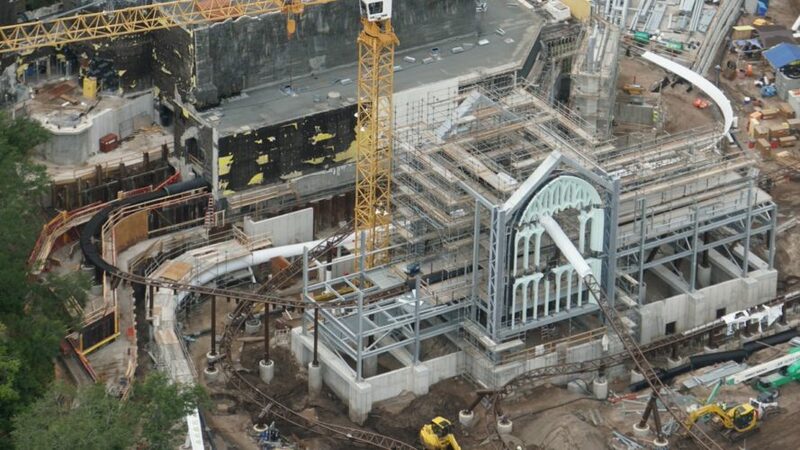 3 Responses to New Photos of Construction at Universal Orlando’s Hogsmeade Attraction May Give Biggest Thematic Clue Yet!